foodnutzz...by nature & nurture! : oh my goodness the dessert! oh my goodness the dessert! You know when you’re invited to a dinner with friends and you kindly offer to bring dessert, then suddenly the day comes and you've totally forgotten you were bringing something until the last minute.....well that was my dilemma yesterday. After a day running around doing errands it was 3.45pm when I got home....then I remembered the dessert! How was I going honour my commitment and still get ready and be at my friend’s house by 6 #$*)*%*#! Being the foodie I am, my friends were never going to let me get away with buying something or just bringing fruit salad and ice cream. Surely I could whip up something. 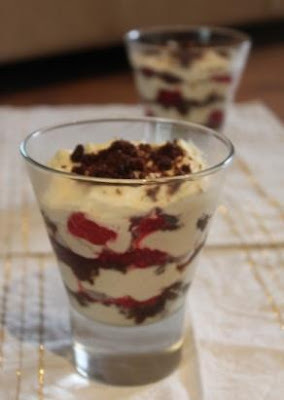 I then remembered I had some cream and mascarpone in the fridge and after a quick rummage through the rest of my kitchen I found a pack of Arnott’s Choc Ripple biscuits, some vanilla bean paste, some frozen raspberries and a little added kick from the cocktail cabinet. With a quick whip in the kitchen, it didn’t take long for me to create a simple twist on Tiramisu. And what a delicious success. There’s no better recognition for your cooking then empty glasses, scraped clean, and a resounding ‘My god that was incredible....you have to give me the recipe’. Place cream and vanilla bean paste in the small bowl of an electric mixer. Beat on high speed until firm. Fold through mascarpone until well mixed. Place a heaped teaspoonful of mascarpone mixture in the base of four 1 ½ cup capacity glasses. Place Frangelico in a small bowl. Dip a biscuits into Frangelico. Roughly crush over mascarpone in one of the glasses. Top with a few raspberries. Top with a heaped tablespoon of mascarpone mixture. Repeat twice to obtain two more layers. Repeat to make 3 more individual tiramisu desserts. Crumble remaining biscuits over top. Place in refrigerate for at least 30 minutes to chill or cover with plastic wrap and refrigerate until ready to serve. Serve with a shot of Frangelico, if desired. In place of raspberries use strawberries or pitted cherries. Instead of Choc Ripple biscuits you could also use Premier Choc Chip, Granita or Butternut Snap cookies. For the butternut snap I’d omit the raspberries and use some chopped mango or chopped canned peaches or pears and use a dessert wine like Botrytis Semillon or Butterscotch Schnapps or Grand Marnier in place of the Frangelico. For a non-alcoholic version use some orange, cranberry or apple juice in place of the liqueur. You could also make this into a large dessert for 8. Double the ingredients and then layer in a 10 cup capacity dish.